Leading ultra-luxury cruise operator Silversea is to sail to even more remote and stunning destinations from 2014 with the arrival of its newest expedition ship, the 128-guest Silver Discoverer. Aboard Silver Discoverer, guests will be able to explore remote areas of Micronesia, Melanesia, Polynesia in addition to the Russian Far East, Southeast Asia, New Zealand and Australia, including one of its hidden treasures, the Kimberley. This vast area in North West Australia is three times the size of England and three-fifths the size of Texas. The small-sized ship, the eighth in Silversea’s fleet, will become part of the Silversea Expeditions fleet, which already includes Silver Explorer and Silver Galapagos. Since launching in 2008, Silversea Expeditions has established itself as the world’s leading, ultra-luxury expedition cruise line enabling guests to view extraordinary scenery; get closer to marine life and wildlife; as well as viewing first-hand some of the world’s last wildernesses in a manner that is sympathetic to the environment. All this is offered aboard authentic expedition ships with some of the world’s leading expedition experts. Silver Discoverer is undergoing a major refurbishment prior to entering service on 1 March 2014 and will consist of five suite categories. She can accommodate up to 128 guests and has extensive facilities on board including 12 Zodiac boats and a glass-bottom boat for unique exploration of marine life; a swimming pool; a gym and beauty salon; a restaurant and pool grill; a lecture room for in-depth stories and briefings about the destinations and a panoramic lounge. She weighs 5,218 tonnes, is 338 feet long and 51 feet wide. Guests will benefit from the huge knowledge and experience of the highly qualified Silversea Expeditions team consisting of 11 experts, from expedition leaders, divemasters and marine biologists to historians, geologists and naturalists. Thundering waterfalls, plunging gorges, Aboriginal rock art, deserted beaches and fewer people per square mile than almost any other place on earth — this is The Kimberley. Cruise by Zodiac through an untamed wilderness, searching for eagles and ospreys in the mangroves, and mud flats, and keeping an eye out for saltwater crocodiles. Witness the spectacular tidal change at Montgomery Reef, view King George’s towering twin falls plunging over 551 feet, experience the sheer vastness of Mitchell Falls from a helicopter, photograph the spectacular Bungle Bungles with their black and orange bands. Embark in either Darwin or Broome, Western Australia. Long closed to Westerners, the Russian Far East is one of the planet’s least explored and most remarkable destinations. Here you’ll find untouched forests, pristine tundra and vast amounts of wildlife: brown bears for hunting salmon, basking seals and sea lions in the thousands, millions of seabirds breeding and feeding their young. Even whales, including the rare western Grey Whale, have begun to return to the Sea of Okhotsk. From Sakhalin and the western Kamchatka Peninsula to the Kuril Islands, this voyage explores the remote region where nature has exceeded herself, and travellers have only begun to set foot. Highlights included cruising by Zodiac to search for bears, arctic foxes, sea otters, seals, whales and the mighty Steller Sea Eagle; photographing smoking, snow-caped volcanoes; exploring rivers with salmon as they roar through taiga forests and following in the historic wake of legendary explorer, Vitus Bering, the founder of Petropavlovsk. Embark and disembark in Otaru, Hokkaido, Japan. Labeled as “The Country of a Thousand Islands,” Indonesia is in fact a country of over 17,000 islands sprinkled across the Indian and Pacific Oceans between Malaysia and Australia. The world’s largest archipelago is an astonishingly beautiful nation with its powdery white beaches, sparkling turquoise seas, jade landscapes and misty volcanoes. Highlights of this 17-day voyage include visiting Komodo Island and enjoying close encounters with the world’s largest lizard; snorkeling with dazzling tropical fish; and going on a “mock” whale hunt with the whalers of Lamalera. From Cairns in Australia to Auckland, New Zealand via some of the most remote atolls in the Pacific Ocean. You will experience some of the best snorkeling and diving in the world, as well as participate in local traditional ceremonies and learn about ancient customs. 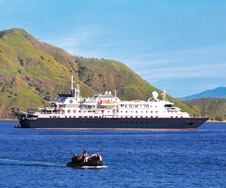 The fleet of Zodiac boats enable Silversea guests to visit small islands and atolls simply not possible with larger ships. Among the highlights are the chance to explore the Phoenix Islands protected area in Kiribati, Bora Bora and New Caledonia, the Cook Islands, Kennedy Island also known as Plum Pudding Island in Solomon Islands, Luganville and Champagne Beach in Vanuatu. Silversea has an exclusive partnership with the world renowned Royal Geographical Society which today continues its long tradition of supporting scientific research around the globe. This partnership gives Silversea guests exclusive access to in-depth background information and historical archive material about many of the destinations visited by the Silversea fleet. Through the highly qualified Silversea Expeditions staff, guests will benefit from daily briefings to explain the wildlife, nature and geography of destinations visited, supported by RGS material, such as maps and artifacts, as well as their geographical expertise.